September 11th 2011 in addition to it being the 10th anniversary of 9/11 =( It was also Sunday so I wore this to church I LOVED this outfit I felt pretty and silky and luxe, and no this isn’t a dress it’s a skirt and top with a belt. The dress-like affect is fabulous. 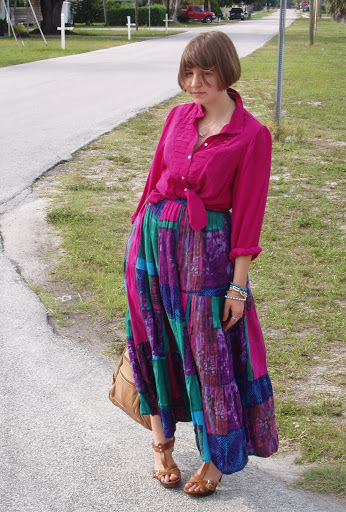 September 15th 2011, I was all dressed up and running errands in this delightful mixed print outfit and lo and behold we took the pics and it looked like I had no waist! What!!! How could I venture out of the house in an outfit that hid my tiny little waist… So here’s the only pic I deemed fit for the interwebz. 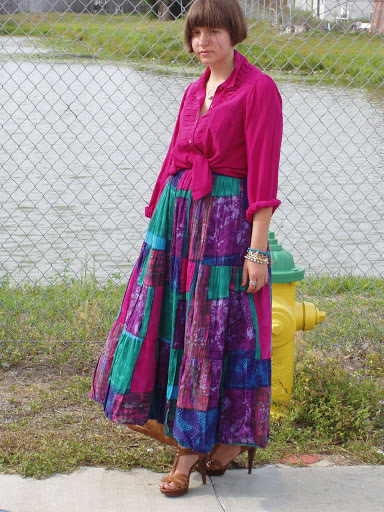 September 27th 2011, I wore this to school and I loved the scarf in retrospect I feel this outfit was bit dour and meh…. But at least the scarf was nice. I think a bright smile could have helped tremendously. October 2nd 2011, A church outfit, I loved both the skirt and top so much. October 9th 2011, Another church outfit. Another favourite I felt SOOOOOOOOOOOO good in this outfit colour and fun shapes work wonders and it was all vintage! Go vintage! October 16th 2011, Church outfit in this AMAZING vintage pleated skirt… Love that skirt I still have it and wear it… It’s a beaut. October 30th 2011, In theory I like this outfit in practice not so much… Why, you might say?? The colours are too dark, and not enough bright in there and my clothes eat me up, they wear me instead of I wearing them.. Always wear your clothes. Don’t let them swallow you. Also my hair is a bit overdue for a washing, sometimes I get lazy especially when I was younger. November 12th 2011, Art walk in shorts and silk, feeling classy! Also I chopped of my hair actually I cut it myself with the clippers! I had guts to spare. November 13th 2011, Church day in my newly shorn hair. The one thing I do not like about this look is how thick the skirt makes my waist look… it may not be too obvious in the pic but I could tell when I wore it which bothered me… So if you like your waist tiny keep it from looking thick. November 20th 2011, My Sophia Loren skirt I had just watched Houseboat for the 1st time so it inspired this outfit. If you love old movies and Carey Grant and/or Sophia Loren I highly recommend that movie, it’s so very sweet. November 27th 2011, Church outfit! Trouser jeans and this AMAZING set of earrings set the tone for this simple yet dramatic outfit. I won the earring from LA Lynn’s. It was the 1st thing I have ever won on the internet and I was so happy I wanted them so bad. The earrings were so bold I only wore one. So keep your accessories moderate. Too many accessories looks cluttered on most people… Iris Apfel is a genius at pulling off lots of accessories. December 9th 2011, An art show at my brothers school prompted this outfit I got quite a few compliments wearing this. It does feel nice to look and feel pretty. December 24th 2011, Christmas Eve! This is what I wore to Church. I love Celebrating my Saviours birth every year. ❤ Jesus is the reason for the season. See you all in the 2012 Post!